Last week I have been sketching in Utrecht twice. On Wednesday a few of my sketcher friends came to Utrecht and we sketched together for a lovely afternoon. I tried something new, I divided my sketchbook pages into blocks and sketched in the spaces. When I removed the tape, it looked fabulous! In all drawings I painted the colors before adding the pen lines. 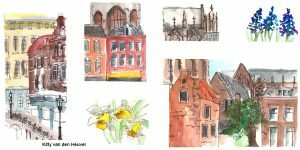 And last Sunday was the monthly sketchcrawl of the Utrecht Urban Sketchers. This time we visited the Railway Museum in Utrecht. So much to see, so much to sketch. We will be back in the next winter season!